Harvard University Press, 9780674051218, 304pp. The three most important Supreme Court Justices before the Civil War--Chief Justices John Marshall and Roger B. Taney and Associate Justice Joseph Story--upheld the institution of slavery in ruling after ruling. These opinions cast a shadow over the Court and the legacies of these men, but historians have rarely delved deeply into the personal and political ideas and motivations they held. 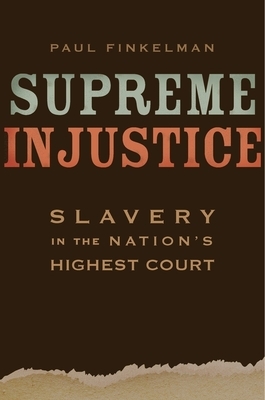 In Supreme Injustice, the distinguished legal historian Paul Finkelman establishes an authoritative account of each justice's proslavery position, the reasoning behind his opposition to black freedom, and the incentives created by circumstances in his private life. Finkelman uses census data and other sources to reveal that Justice Marshall aggressively bought and sold slaves throughout his lifetime--a fact that biographers have ignored. Justice Story never owned slaves and condemned slavery while riding circuit, and yet on the high court he remained silent on slave trade cases and ruled against blacks who sued for freedom. Although Justice Taney freed many of his own slaves, he zealously and consistently opposed black freedom, arguing in Dred Scott that free blacks had no Constitutional rights and that slave owners could move slaves into the Western territories. Finkelman situates this infamous holding within a solid record of support for slavery and hostility to free blacks. Supreme Injustice boldly documents the entanglements that alienated three major justices from America's founding ideals and embedded racism ever deeper in American civic life.